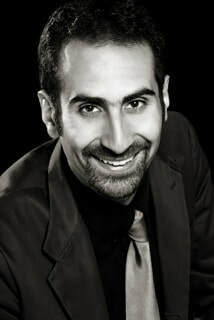 Fahad Siadat specializes in theatrical music for vocal ensembles. His work explores the differing sound possibilities of the voice, using both standard notation/singing as well as extended vocal techniques. He holds a Master of Fine Arts from the California Institute of the Arts in Music Performance and Composition with a focus on Vocal Music, and a Bachelor’s of Music in Theory and Composition from Vanderbilt University’s Blair School of Music. Fahad has composed for a variety of ensembles, dance, and theater companies: the California EAR Unit, New Century Players, CalArts Singer’s Collective, TOCCATA Orchestra, and Warrior Poet Theater Group, as well as public schools along the west coast. He has most recently performed with the C4 Vocal Ensemble, Choral Chameleon, and Polyhmnia in New York, the TOCCATA Orchestra and as a guest vocalist with PARTCH in Los Angeles. He serves as composer-in-residence for the TOCCATA Orchestra in Lake Tahoe and Warrior Poet Theater Productions in Los Angeles. He is also an active performer of Brazilian music and dance and has performed with Capoeira Narahari and Raizes do Brasil, is a rock-climbing enthusiast, and a tri-athlete. For more information about his current work visit www.fahadsiadat.com.